In effort to provide the best service possible, we’ve invested in the best tooling, the latest technology and we’ve taken the time to master the most cutting edge techniques. This constant search for a better way has led us to the Plek. What is a Plek, you ask? 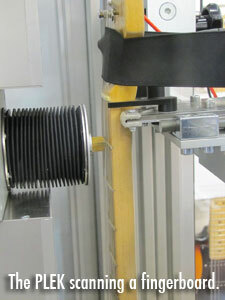 A Plek is a computer controlled fret leveling tool, which in the hands of an experienced tech, can provide an unparalleled fret job. It levels frets with an accuracy of .001″, assists in the process of making nuts, and offers extremely advanced setup functions. The greatness of a guitar is directly tied to the quality of its fretwork. If the frets aren’t level within a tolerance of about .0005″, notes can buzz and fret out, no matter how many adjustments are made on the instrument. Every guitar, no matter how expensive, no matter how prestigious the brand, is susceptible to uneven frets. 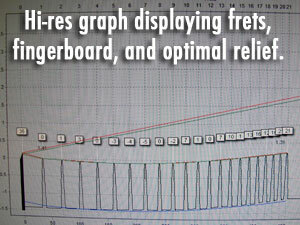 Not only are frets rarely perfect from the factory, they also wear down over time simply by playing the instrument. If you have ever been unsatisfied with your instrument, and haven’t been able to adjust it to your liking, chances are you could benefit from having your guitar Plek’d and carefully set-up for your playing style. Over the past 10 years, working with our custom neck jig, we’ve gained a thorough understanding of how the guitar neck works and SF Guitarworks has established a reputation for providing impeccable fretwork. This experience has uniquely prepared us for the advanced capability of the Plek. The knowledge we’ve gained, by hand and eye, about guitar necks under string tension, while meeting the exacting standards of high caliber players, allows us to utilize the Plek to it’s fullest potential. The Plek has, in essence, become our best second pair of eyes, allowing us to hone in on the most minute details. Make no mistake: the Plek is a tool. To fully realize the guitar’s capabilities, it requires a skilled operator who truly understands how a neck works. We fully stand behind our previous work on the neck jig. In fact, we’ve checked our fretwork on the Plek and it’s stellar. So why did we switch to the Plek? The Plek allows us to work to an even greater degree of accuracy, expand our fretwork capabilities and complete fret jobs in a more efficient manner, so you get your guitar back faster and better than ever. We can simply and accurately customize your fretwork in ways that would be difficult to achieve, and impossible to measure, with traditional hand tools. Another advantage of the Plek is that the frets are scanned and leveled with the proper amount of neck relief already present. This eliminates any unpredictability sometimes found when introducing relief into a flat neck. We could talk theory endlessly, but the practical application is pretty straightforward. Here’s how it works: we start by discussing your playing style and specific needs so that we can custom tailor the playability of your instrument. We then prep your instrument by measuring its action, gluing its frets if necessary and stringing it with your chosen strings. 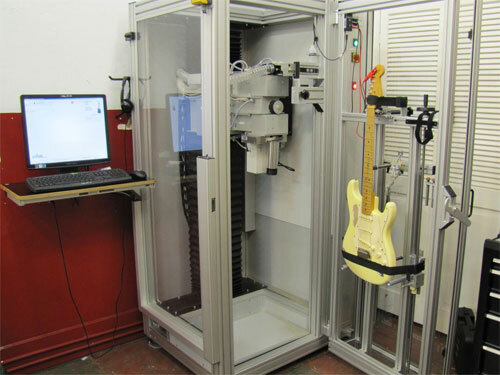 After placing it in the Plek, the Plek scans the neck, registering over 6,000 measurement points for each guitar, and creates a high-resolution graph of what the fingerboard and frets look like under actual playing conditions. Using the information contained in the graph, our knowledge of your playing style and our understanding of fretwork we then set the parameters to be used by the Plek when leveling the frets. Based on playing style, fret height, radius and other factors, we can create a straight radius for a traditional feel, or a compound radius to facilitate easier chording and bending. Combined with a proper setup, your Plek’d guitar will play easier and sound better than ever before. Feel free to drop by with your guitar and we can discuss your options, and of course we’d be happy to show you the Plek. We love to talk tools. Want to know more about the Plek? Check out their website at Plek.com! Can you do a plek setup on stainless steel frets? If so, is there an additional charge? What would be the cost if the nut, and some, or all of the frets needed to be replaced on a Strat? 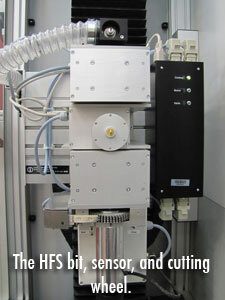 In addition to the PLEK process. In this scenario, the fingerboard and neck are not damaged in any way. Also, do you take shipped in guitars? What is the usual turnaround time for a non-rush, shipped-in guitar? I’m really looking forward to having the PLEK process done. Thanks. I have a 1975 Martin D12-28, (with a little belly bulge), that I would like to make as playable as possible. What’s the “ballpark” figure on getting it Pleked and repaired? Hey Nathan. A Plek would definitely improve a lower end instrument and make it better to play. If you are willing to invest the money, it would play better than some US made stuff we see coming out of factories. Give us a call if you want to talk more specifics – 415-865-5424. You don’t need an appointment to stop by. Current turnaround time is one week. We’ll see you soon! can i just … walk in to the san francisco location with my jaguar for pleking? do i just drop it off? If I’m not in a RUSH, whats the average turn around? Thanks, I’m really excited! Our PLEK is at our SF location so same day turnaround would be difficult in Petaluma…we would at least need a day or so to bring it into SF and then bring it back to Petaluma (could be possible if you drop them off in the morning and can pick them up in the late evening). Give us a call if you’d like to make the arrangements – 415-865-5424. It’s $285 +strings for the Floyd Rose and the Schecter would be $260 +strings if you haven’t added a FR to it. There is a rush charge of $50 an instrument for same day PLEKs. Am interested in Pleking at your Petaluma location on a future appt (I live 7 hrs away and will need to schedule far in advance). In the meantime, I would like a ballpark price to fully Plek (scan and implement changes) an Ibanez JS-100 (upgraded to a JS-1200) and a Shecter HellRaiser Diamond Series. I just need to know roughly what to budget for. How Much does the Plek treatment cost?